HomeShop by CalendarMelanoma MondayMelanoma AwarenessSkin Cancer Prevention UV Color Changing Wristband - Youth 7"
Skin cancer often has its roots in too much sun exposure. Use these fun, simple color changing UV wristbands to remind everyone to protect themselves from over exposure to the sun. New from SupportStore! Wear this wristband out into the sun and it quickly, "magically" changes color from soft white to purple. 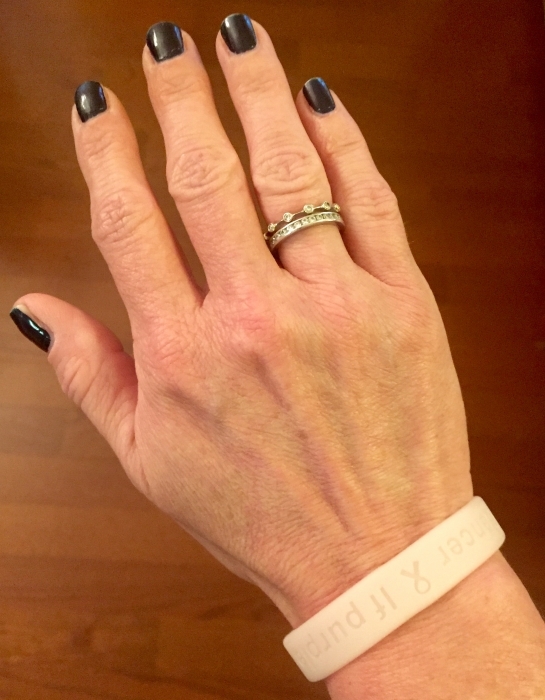 The color change and the message If purple - PROTECT - Prevent Skin Cancer is a reminder to the wearer that when purple you are exposed to strong UV rays. This SupportStore designed wristband is made of UV sensitive 100% silicon rubber, so you can wear it on the beach or in the pool. The color change effect will last for many months, if you keep your wristband out of the sun when not being worn. The "Purple - PROTECT" wristband comes in both adult and youth sizes, and is individually bagged. Buy them for your family, or skin care clinics and dermatologists may make them available to clients as a reminder. Order 3,000 or more and customize this product. Enjoy the outdoors, but please be sun smart! Exposure to the sun's UV rays causes a color change to light or deeper purple depending on the intensity of the light. (The light sensitivity and color change feature has a useful life of several months to a year, if kept out of strong light when not in use). Useful reminder to apply sunscreen and protect against sun exposure. Not intended to act as an indicator of when to get out of the sun. Made from 100% quality Silicone Rubber for years of use and promotion of your cause. You may wear this item 24 hours a day including in the shower, at the health club, work, or school. Excellent product the kids loved them because they went from white to purple in the sun and back inside it went back to white. Awesome way to protect our children!! The children really loved these bracelets and watching them change colors out in the sun was a great reminder to reapply sunscreen. Awesome product! My kids absolutely love these bands. I am now able to put sunscreen on them when they put the band on and I show them in the up light that it changes color. Now if the band is purple then they put sunscreen on. No more fighting. Large enough for many adults! I love sharing these with my family, friends and anyone I come in contact with! Some sun-changing products do not change color dramatically, or they take FOREVER to change color. This wristband changes instantly to a dark purple. The deep purple color catches your eye and reminds you to wear sunscreen. It is a great reminder. Kids love it too. It's so intriguing to them. This is a genius idea and it works really well.